I can speak from experience that codes only work for one character. You will get to select the account/character that received the item. However you can only ever redeem one code for that particular item line per account regardless of how many characters you have. Ex: if I buy three tenth anniversary t-shirts I can only use one of the codes. The other two would be useless. Codes also cannot be transferred so make sure you put it on the character you want it to have. @ above No, you can buy and use as many as you wish. If you couldn't my AQW characters 12 Gulls and Jake Aces (who are both on the same Master Account since you can only have one) wouldn't both have CardClasher. The way codes work is that you enter the code and can then select one account per code for every game, even if you've already used that type of code. So for CardClasher for example it presented me with a list of my AQW accounts and for the first code I selected my character 12 Gulls and applied it. Using the second code I selected my character Jake Aces and applied it ( both codes now being tied to my Master Account). In the case of the Calendar specifically you would be brought to a list similar to the one in this screenshot. Only in the case of an entirely unused code it would have a drop down menu to select an account/character from instead of saying "Code already used for this game.". Each code can only be used on one character from per account per game, and then it tells you it's been used. When I used my CardClasher codes for example, though I had 18 characters linked at the time only the one I chose received it which is as it should be. Therefore unless you select the disabled account to obtain the item, it will not receive it. Way back when AQ first came out over 10 years ago I made an account. When Master Accounts were added I opted to make my AQ account my Master Account (I was prompted to do this IIRC). I was.... 8 I think? When I made the AQ account, so naturally I was in the under 13s age group. The thing is, now it's 11 or so years later and I recently turned 19. I'm still in the under 13 age group as far as my Master Account goes though, and this restricts me in certain games. Is there a way to change the age, or do I need to make a new Master Account? That had nothing to do with any question on the page... I'm just asking whether there's a way to change the age on my current one. If not, I need to make a new one and transfer all the linked games over to the new one. I've done a search through portal.battleon.com and while i don't see anything there that can automatically change the age. I got a problem trying to change my email for my master account. I just found out yesterday from my gmail that I was informed that I should come back to Yahoo to reactivate my Yahoo email for 12 months. It seems I came too late to notice the mail. After I was informed; I went to see if it was still there. It seems Yahoo deactivated my Yahoo email. And I was using that email for my Master account. Is there any other way to change an email without a email that does not longer exists for confirmation? @ Raptor Your inquiry sounds a lot like something that was asked in the page before this one. i recently changed my email address and deleted the old one as i realized that it was an extremley childish and innapropriate email address for anyone to possess. shortly after deleting it i went to my artix account to change it to my other email address after my old one had been deleted. as i no longer have access to my old email address the portal wont let me change it. what do i do? After a few days, our system will go ahead and change the contact email to your new one. It guesses that you no longer have access to the old one, and gives plenty of time to confirm or cancel if the change wasn't on purpose. The above was from another consumer and your situation sounds an awful lot like that one. The bottom portion was Captain Rhubarb's reply to the consumer. And, just in the case that doesn't help you. I have one other link to give you. I'm having an issue with the Ultimate Game Card. 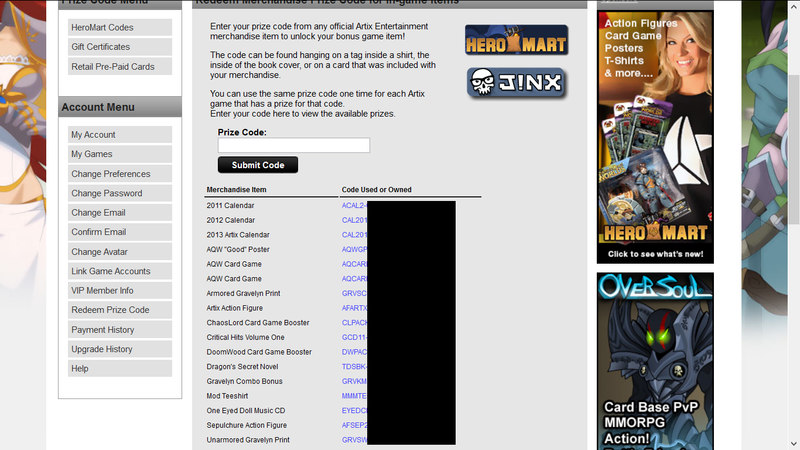 I purchased 10$ worth of Artix points with a 20$ Card. Through currency conversion and such I had some left over points. I want to buy 5$ worth of Artix points but my (Add left over Ultimate Game Card points) isn't showing up but I know i have about 800 UGC Points because after my purchase it said so, so my question is why don't I get an option to add my left over points and I know I was able to do this in the past? Verification only gives small bonuses, such as the Guardian class in DF; full upgrades for each game are handled separately. Does Artix Entertainment have an actual mailing address? Oh and this response is to Dragon Hunter Pete. I bought a 20000 Artix Points package after the promotion of 10% more points was announced, but I only got 20000 instead of 22000 (I used PayPal). Who should I contact in this case and how should I do it? So my friend gifted me a game card, but since he and I are far away, he only gave me the code itself. When I tried to redeem it and click next, the error "Invalid pin number, or system error 43:Invalid Card" came up! Can I have some help? He bought it at a GameStop if it helps. For both of these issues, I recommend the following support link This link to be precise. Than use that for payment issues only. Wolf you may want to also check with your friend about if the gamestop personnel entered all the info correctly on the card he gifted you. Sometimes what happens is that the card itself, doesn't always go through the process correctly. I hope this has throughly answered both of your inquiries with satisfactory results, have a great Frostval. EDIT: Just bought 20k AP package, using Cherry Credits. Got exactly 20k AP. Since I used CC it is probably suppose to be like that assuming the above sentence is true. It is like that now. The $100 is back to its intended 20k points and only if you pay with a credit card will you get the bonus. Is it a Ultimate GameCard? 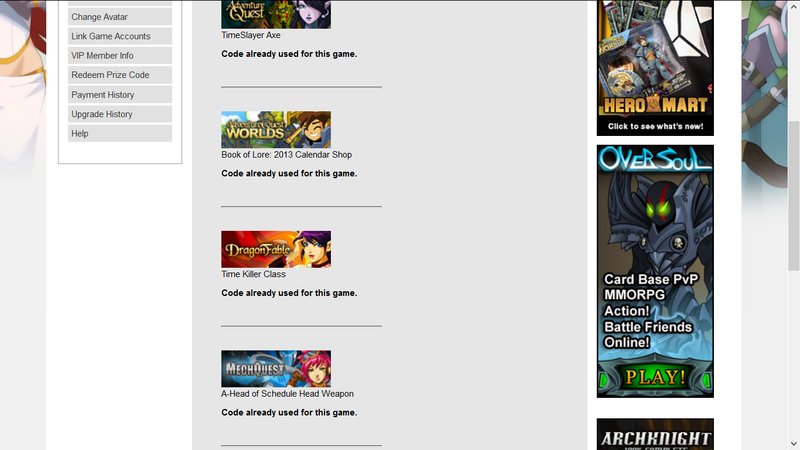 The problem is I forgot my old Master Account email that I registered to it where in I linked my AQW account. How can I fix this issue? I was planning to buy AQW Membership/Adventure Coins using Artix Points in my new Master Account because I already have a Payment History on it. I hope you take a quick action about my problem. Thankyou! You'll want to use the Recovery Page and submit a report for your lost account. When submitting the form, be sure to click the "Email us about your Artix Account (including EpicDuel/HeroSmash/OverSoul)" button - so that it leads you to the proper page. I'm trying to create a master account with one of my alternate email addresses, but it keeps saying "login name already used". So then I try to recover my password, but it says "no matching information found". If there's no info on that email address, how can it be "already used"??? Not sure it may have been banned, some kind of bug or who knows what. Did you try clearing your cache and all that? I know its weird but clearing can fix many different online issues. Did you try creating an account with a different email? If none of that helped try using this form but be sure to completely read this because it may have a solution. It has come to my attention that my main AQW account has been linked to the account name "1lord2of3darckness21". I have no idea who this could possibly be. I have no clue if it is one of my accounts. If it was, it was registered with an email that no longer exists. What could I do? I plan on giving my account on AQW membership, but I do not have any idea what the password is to 1lord2of3darckness21. Zigzag21497: You'll want to submit a report using the Recovery Page. Hopefully that'll sort out your problem.